As I boarded the plane to South America I was so nervous. Luckily my fears were unfounded and as a backpacker with cerebral palsy I was amazed at the ease I had in conquering South America. Like anything in life, there are a few hurdles and challenges to overcome along the way, but nothing that would deter me from chasing my dream and seeing the world. To prepare you for your own great adventure, I’m sharing my experience and top tips for travelling with a disability. I walk with a slight wobble, so yes, I do stick out on a calle in Cusco! But I stick out on a street in New Zealand (my home) also. I am very used to that curious glance and I don’t mind, I am a curious human too… that’s why I travel! In my experience, 99% of attitudes towards being a solo disabled traveller are positive. I experienced all kinds of kindness on my trip; Argentinians bending down to tie my shoelaces, Bolivians offering to carry my bag, Peruvians giving me a hand to climb the uneven steps of Machu Picchu, Brazilians offering me their seat on public transport, hostel owners ensuring I got the highly sought-after bottom bunk and finally, the hundreds of super-friendly backpackers I met along the way that made my trips unforgettable. Genuinely, people’s attitudes towards me as a disabled traveller continue to blow me away. So, if you have a disability, please do not let the fear of people’s attitudes deter you. Backpackers are an open-minded, adventurous bunch and will only support you on your journey. One positive about travelling with a disability is the ability to skip queues or get discounts at certain attractions and tourist sites. During my South America adventure, I visited some top attractions that offered awesome accessibility catering for disabled travellers. I arrived early at Iguazu falls and I was at the ticket booth for less than 1 minute before a staff member noticed me and ushered me to a special booth. There I passed over my cerebral palsy society ID card (TIP: it pays to get an ID card from your organization before you travel) to the ticket issuer, she checked the legitimacy, “Boleto gratis”… I couldn’t believe it, I had FREE entry! “Gracias amiga“, I replied in surprise! It didn’t stop there either, I was offered a cart ride to get around the park which was awesome as I’d heard this park was a biggie! Carts were offered to anyone with mobility issues to get around which was a massive help. I was also super impressed with Iguazu’s wheelchair access as they had wide walkways all around the falls. This site was a shining example of how to cater for travellers with disabilities. Christ the Redeemer in Rio is another must-see landmark that has great accessibility. There are lifts and elevators in place to get you up to the stunning statue. Azucar Loaf Mountain, again in Rio, has a handy “express lane” allowing for travellers with disabilities to skip through the queues and get a discounted ticket. La Paz gondolas (Bolivia) were also easily accessible with lifts in place to get you up and above the highest capital in the world! Buses are your best bet for long distance travel in South America. I was hesitant at first to take a bus in South America but honestly, you don’t need to be. All buses for long distances in South America are double deckers, for best accessibility look at buying a seat on the bottom floor. Also, don’t worry about going to the ‘baño’ beforehand as all buses have small toilet facilities. Tip: Busbud is the best website for both in country and international buses. Colectivos – in Colombia (These are a cross between a bus and a van). They’re available at all bus stations, so try and take a colectivo as these are safer and get you to your destination faster. Keep an eye out for cheap domestic flights in places like Brazil and Columbia, sometimes it isn’t a lot more than busing it if booked in advance. In six months of backpacking, most of the challenges I faced were walking related. The toughest part of backpacking for me was definitely carrying my 60 litre backpack to a new destination every few days. When you have your life in a bag it does get heavy and therefore it can be a bit of a strain on the legs. To combat this, I had a walking stick that acted as a counter balance. I tended to use taxis more frequently than my new travel amigos to head to my next hostel. It was a lot more relaxing than carting my gear around! I also struggle a little on steep terrain or uneven surfaces, such as Machu Picchu, around Salar de Uyuni or the Basilica del Voto Nacional. Climbing up the steeple of the Basílica del Voto Nacional in Quito was also fairly challenging. The steps are more vertical than a skyscraper, and the drop below had my heart racing! Encouragement, patience and helping hands from my fellow travellers meant this gringo didn’t slip and I proudly completed the climb! Walking around late at night in big cities can be nerve-racking. My tip would be to ensure you go with friends. Also, if you are going out-out I’d recommend sticking to the discotecas in popular areas along busy and well-lit streets. The Hostelworld app gave me a quick and easy way to book a bed! Amazing view over the main square. No stairs at all! Open and really accessible! Here I was offered a special room on ground level. A lot of other hostel receptionists kindly offered me accessible rooms, this was one great example. Travelling around South America was an experience second to none! I won’t only remember the incredible locations and landscapes but more importantly the people that made this trip unforgettable for me! Gracias America do Sul!! The post Backpacking with a Disability! 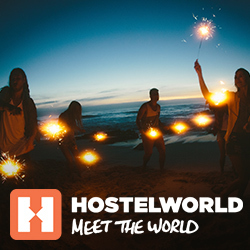 (South America edition) appeared first on Hostelworld Blog.